This ninety-minute DVD features famed Idaho angler Mike Lawson and South Fork fly shop manager Todd Lanning in an action-filled educational adventure that covers where and how to fly fish the entirety of this World Class angling destination. This Idaho fishery is home to native Snake River cutthroat trout and the result is a fly fisher’s amusement park where wild fish readily rise to abundant hatches. Six distinct sections of the South Fork and four different fly boxes are in the ten fact-filled DVD Chapters. Three thousand trout per mile have been counted on the upper sections of the South Fork. It holds over 60 miles of fishable banks, runs, riffles, current seams, side channels, and most any other type of trout water you might imagine. There are even twelve miles of road-less river, the famous “Canyon Section”, where unmatched angling is only equaled by spectacular scenery. Six different mayflies, a variety of caddis, numerous stones, and a host of terrestrials are just part of the South Fork’s prolific food chain. You’ll explore it all in this feature-length DVD that has graphic sequences of both angling action and instruction. Native Cutthroat and Wild Browns are the real stars of the video. You'll see both their deliberate takes of dry flies and slashing grabs of big streamers. Detailed dialogue ensures you’ll be ready to fish the South Fork of the Snake when you arrive. Discover the many faces of the South Fork, the techniques and flies for fishing them, and where and how to reach the key wade and boat access points. The examination of a variety of water-types and the demonstrations of numerous fly fishing methods make this a video every angler can learn from. Mike Lawson & Todd Lanning host this information-packed adventure and do a great job showing you where and how to fish the river. Mike, dean of the Henry’s Fork, grew up close to where it joins the South Fork. His life-long familiarity with the fishery makes for some deep local knowledge. Todd, a self-confessed “Trout Bum” turned fly shop manager, has a valuable day to day guide’s perspective. 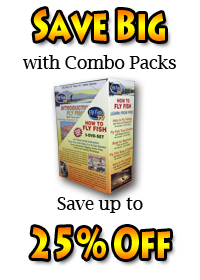 Together they make this Fly Fish TV “River Series” DVD, South Fork of the Snake River, a valuable addition to any fly fishers’ video collection.